Warmest May “Evah”? No, That Was In 1833. 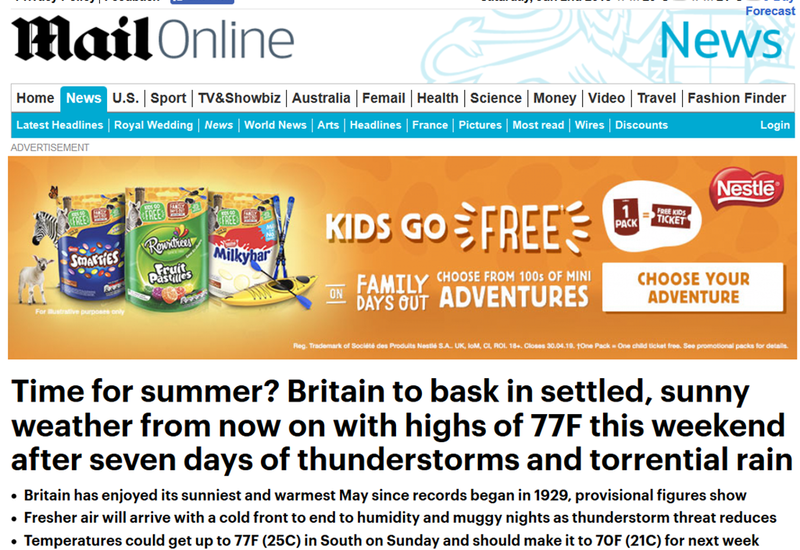 Britain has enjoyed its sunniest and warmest May since records began in 1929, provisional figures show, despite the week of torrential rain, thunderstorms and flash flooding that has brought travel chaos to Britain…. A total of 245.3 hours of sunshine were measured across the country last month, according to the Met Office, making it the sunniest while it has also been the warmest May since records began in 1910. The average daytime maximum temperature was 62.6F (17.0C), just beating the previous all-time high of 62.4F (16.9C) set in May 1992. Despite thunderstorms bringing showers and flash floods to parts of the country at the end of the month, rainfall across the UK in May was less than two-thirds (64 per cent) of the level expected. Rainfall in England was 72 per cent of the long-term average for the month, while in Wales it was 62 per cent and in Scotland just 55 per cent. Northern Ireland’s rainfall was 80 per cent of the average. I heard exactly the same claim on the radio yesterday as well, so it is not the Mail that has misinterpreted. The mean Central England Temperature was 13.2C last month. Tim Legg claims they only have records going back to 1910, which is strange because Legg himself maintains the CET, which has data back to 1659. A closer look at the warmest months reveals nothing out of the ordinary about last month. Given how much effort goes into producing the CET, it is remarkable how often the Met Office ignore it when it suits them. Ha I like the way the same guy’s latest tweet gives you a reason not to accept smartmeters. Just say you are boycotting Japanese components like he is. The Express has been featuring a full page “Smart Meters – The Facts” for 3 weeks now. On first glance it appears to be a bit of investigative journalism, but is really nothing more than a puff-piece for Smart Energy GB. There hasn’t been a single letter of complaint printed, which makes me wonder if they are deliberately withholding any that come in. Newspapers and magazines should headline a piece ‘Advertorial’, and usually do, if it is not generated as part of their normal content. It can be produced by a staffer or freelance, but it should be identified if not ‘pure’ editorial. I’m about to change my energy provider and have found their new trick: several of the tariffs are tied to accepting their smart meters. This is made to look like a big benefit to the user. The Gove-rnment is behind this of course trying to force the meters down our throats. FT reporting the Swansea lagoon has bitten the dust. Behind a paywall, anyone able to confirm? It’s interesting Googling ‘Swansea lagoon project’ and setting the period to ‘past week’. Nearly returned results are that it will be cancelled. It includes more spin than the project’s fleet of turbines would achieve during a perigean spring tide. Even more strange, we here in Scotland were told that it was the warmest Scottish May on record on the Scottish news. May was a positively chilly month in Edinburgh, for the time of year, and I even had the fire on a few times. No it hasn’t. Here in the Lakes It has been a month of warmish spells then coolish spells, rain, thunderstorms, even hail during one thunderstorm with a few days of heat strung together. What is a ‘normal’ month of May weather. No mention of April, March or Feb then? One of the advantages of the constitutional arrangements of the USA is that the lesser states actively compete to attract immigrants and businesses. CA is forgetting this, just as Mass and NY did in their time. Woody Guthrie’s song “If you ain’t got the Doh, Reh, Me”. about 70 years ago, was about the need to be rich to live in CA! Plus ca change ….. Such hypocrites. California has perhaps the highest levels of inequality of any state, and has a huge problem with house prices. So a bunch of Lefties makes new houses even less affordable for the low paid because they really, really “care”. No wonder some firms are moving away from California so their workers can afford somewhere decent to live. Indeed, and what will the power companies do when their profits are hit? Invest in more infrastructure? Nope. Cut executive pay? I doubt it? Sack workers? Probably. Outages are commonplace in hot weather in LA and some of the other cities of the southern part of the State. Will solar panels cure them? Maybe, maybe not, but definitely at the expense of jobs. BBC is carrying the same record story too. Their claim is based on the highest average maximum, it being 0.1C higher (wow), rather than the highest mean. Smacks of desperation – you can always find a record. Warmest first week, warmest consecutive 3 days, warmest BH!! !, who cares. The highest daily maximum record was not broken, the highest daily minimum record was not broken. So nothing extreme heat-wise at all. 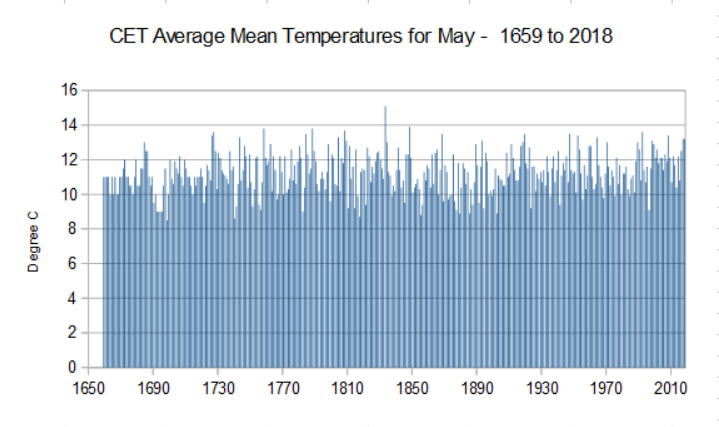 The clue is that it was probably also the sunniest May on record i.e. chance weather. It makes an enormous difference this time of year if it is cloudy all day or sunny all day – about +10C here on the south coast on sunny days cf cloudy, with the same air mass. Yes, why average maximums and not average max-mins? And 0.1 degree? Comparing averages that can differ greatly in all sorts of ways – exactly the same sites in exactly the same state of example? – is absurd at at level of accuracy. Just a single changeof site or one fewer/more could easily make a 0.1 degree difference. A major reason for the lovely hot May is probably that the wind has been predominantly from the East, as it was during the earlier (cold) Beast. This would also explain the relative absence of clouds. If so it was warm continental air what did it, no doubt the EU will seek payment for it after Brexit. Right now, “the jet-stream” has retreated North, all the way to Greenland, where, under its influence, the snow is falling in record amounts for the time of year. Am I too late with this news? Has the BBC “pipped me to the post?” It is always so eager to bring weather records to our attention. I note that the ToryDailygraph has a rather good piece by Simon Johnson, Scottish Political Editor, about the (deranged and irrational) logic of removing a million trees from Scotland so that we can ‘save the planet’ with more beautiful (beauty in the pockets of the of the owners) windfarms. Not much in the way of urban heat islands in 1833 either. When Mr Scrooge allowed Bob Cratchit to put an extra shovel of coal on the fire in 1843, an unintended consequence was the start of global warming. Down here in Devon the weather seemed to go straight from a cold and wet winter in April into a warm and mostly dry summer in May, with hardly any sign of a spring. It has been wonderful for plant growth. If that is what “climate change” is bringing, give me more of it; so keep pumping out that CO2. Natural warming, naturally! Also, and good to shut the CH off (about mid April). Though, I vaguely ponder, speculate on Kilauea (although not a major eruptive episode quite yet) and if its outgasing of particulates and aerosols will affect the NH atmosphere to any degree, later on in the year, possibly? The UK dairy industry ought to have a record year if the green growth in my s-e UK garden is anything to go by. Lush and rampant. May here in Liepaja, LV, hottest on record, although the records only go back to 1880. The contrast to what is happening in the Arctic is interesting, where DMI reports ice extent and volume not decreasing as expected, and temperatures for north of 80 degrees below average for the time of year. Always worth a look at the broader picture. Because the amount of “temperature” is fixed, so if we are hotter than average (by more than AGW has warmed us if you believe that) somewhere MUST be colder than average. The arts graduates at the BBC and elsewhere don’t understand the very basics. Something about the Met Office’s announcement doesn’t stack-up. I agree. Use of domestic heat (even briefly) or different types of clothing. Ice cream and soft drink sales statistics are other good indicators of a hot or warm or cool or cold month, season or year. They often give the lie to media claims. They are declaring this May the US as the hottest on record also. Establishing the true “record extreme” for anything is, actually, an incredibly difficult task. Almost by definition, it will be a fleeting phenomenon, only slightly different from many other instances. As such, it will often be a mere curiosity and of little scientific interest. Where did you get the two graphs? 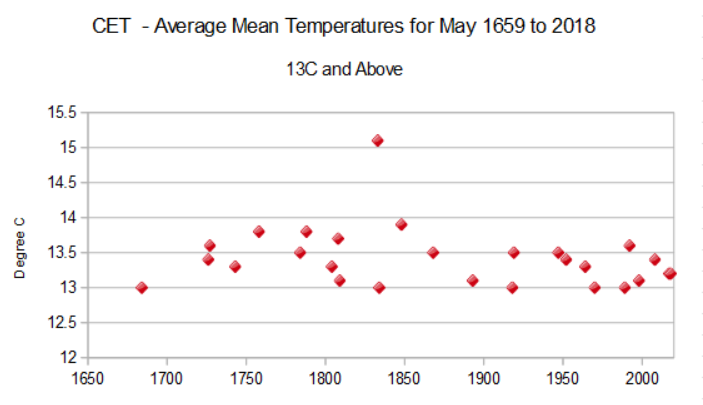 The first graphs is labeled “CET Average Temps for May 1659 – 2018…”? Is there a link from the http://www.metoffice.gov.uk website that displays those graphs? Or did you generate those graphs yourself?